In Expression.Essentials, we discusses the basic and advanced features of expressions within After Effects. Perhaps the most powerful tool within after effects, this training will give you a deep understanding of expressions that will undoubtedly take your visual effects and motion graphics to the next level. In this series of tutorials, we'll talk about some of they ways you can make improvements and corrections to video footage using After Effects. We'll start by stabilizing shaky footage shot by a handheld camera. We'll use the Warp Stabilizer effect to smooth the motion in our shot and we'll talk about which settings to use for different types of footage and what results to expect. Incorporating a 3D camera into an otherwise 2D shot, or mixing 3D and 2D layers together brings 3D reality to the 2D screen. But there's more to it than simply adding a camera or camera track to a composition. You need to match the characteristics of a real, physical camera: replicating how it sees the world. You need to match the color of the original shot, or maybe even make creative adjustments. You might need to tweak the lighting, match motion blur, or compensate for lens distortion. You might even want to take advantage of high dynamic range (HDR) imaging techniques or experiment with different filmic looks. In this course, Mark Christiansen takes you through these scenarios and the next step in After Effects compositing: matching a shot and making it look not just realistic, but cinematic. 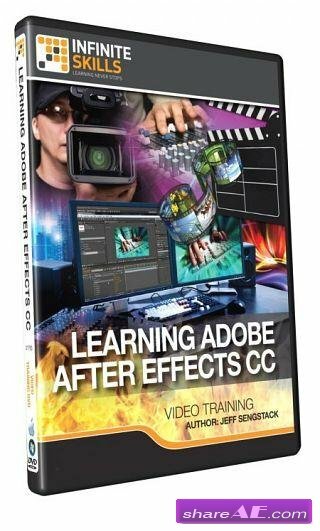 *Updated November 2013* In this Adobe After Effects CC training course, expert author Jeff Sengstack teaches you how to get the most out your post-production effects and compositing with this powerful software from Adobe. Designed for the beginner, you will learn how to use After Effects CC from the ground up, no previous experience is necessary! In this series of After Effects tutorials, we will learn how to rig a camera using an animated Null object in After Effects. We will start out by getting a few things set up in the project with importing assets. We then move onto getting the position of the Null object set up. This project execution requires a knowledge of Spatial and Temporal keyframe interpolation, which we go over as we are setting up the animation of the Null object. In this series of After Effects tutorials, we will learn how to animate a logo using particles and animated videos to reveal and enhance the logo presentation. 90 Minutes of Motion Graphics Training in After Effects. For Beginner and Advanced After Effects Users. Learn how to take these motion graphics projects through your entire workflow! Bonus material included! Learn my entire workflow for creating these motion graphics projects in After Effects. This training helps you with everything from creating the shapes and animations to the look in each video with a step by step process using Adobe After Effects with a few hints from Cinema 4D. What makes a 3D space battle even more spectacular Compositing in Adobe After Effects. Learn to take the render-pass sequences of the spaceship versus asteroid scene you created in part 1 of this series and recombine them in After Effects. Author Lee Lanier shows how to integrate shading and color in your render passes, animate the flames emitting from the spaceship, and create a particle simulation that makes the asteroid explosion seem more realistic. You'll also learn to replicate glows, lens flares, film grain, and camera motion along the way. Lens flares are ubiquitous. They’re in commercials and promos, TV shows, and feature films. And most of the time, those flares were created with the Optical Flares plugin for After Effects. After Effects Guru helps you dig deep into advanced After Effects options and techniques. This first installment focuses on the new CINEMA 4D (C4D) Lite plugin-a slimmed down version of MAXON's 3D modeling program offered with After Effects CC-and the exciting ways the two programs integrate. In this series of lessons, we will learn how to take a pretty good motion graphics animation and make it an amazing one. This tutorial takes a little bit of a different approach than the way that we normally go about creating something together. We will have an animation that has already been made and go over what is wrong with it or what could be made better. We then start making those changes and refine the animation. In this series of After Effects tutorials, we will learn how to use the new Ray-tracing feature in CS6 to create 3D animated typography and shapes. We begin this tutorial in Illustrator, where we lay the ground work for our image. This creation step contains vital information for how the Illustrator file must be set up for it to work once it has been imported to After Effects. We use a few scripts that speed up our process tremendously for some of the more repetitive and tedious parts of the project. Lower thirds, opening titles or ending credits, it’s more then just text, it has to fit in with your film project. And not only the font, but there is a lot we can do to design such titles. Going from 3D text, text animation, colors, motion tracking, etc. In this course you will a very creative part, but also a technical part to understand how we need to handle those titles. Sometimes the movie making magic doesn’t happen on the set, but in the editing room. In this course, we learn how to make some of that magic happen using Adobe After Effects. One of the best ways to add polish and flare to your videos are motion graphics. But doing that using Adobe After Effects takes special skills. Fortunately, we’ve got that covered. In this set of tutorials, we’ll go through the process of animating three logos in After Effects. Logo animations can be difficult to create without the proper preparation in the program they were originally designed in, so we take the first few lessons of the course to split apart the assets in Illustrator. This way, when they’re imported to After Effects, we have a much easier time animating them. We learn techniques for using the Puppet tool and some of the challenges that come along with that tool. We also use expressions and sliders as well as some parenting chains to create a paper-doll style rig. Each of the three logos present a unique challenge, and have lots of different techniques to cover so that when you’re faced with a logo to animate on your own, you’ll be ready for anything. By the end of this course, you’ll have a great understanding of the methods for animating 2D logos and what it takes to give them realistic movements. If you’re serious about adding logo animations to your motion design body of work, this course is a must-watch.